The families evolved into crime cartels whose members moved into other parts of the world. The animals passed from warrior to warrior, including non-Asians. Half of the dizhi were power-hungry, wanting to conquer and absorb the others. The other half went into hiding to protect themselves. Each dizhi has two bearers. They're the only two people who can assume the form of the animal, and never both at the same time. 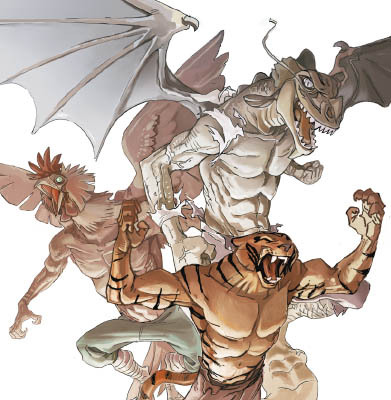 Angel didn't inherit the tiger power from his family. His father had heard of the dizhis, and tried an ancient ritual to get one, but nothing had happened (as far as he knew). In fact, the ritual had worked - the tiger attached itself to the purest soul in the house, who was Angel when he was still a baby. His tiger form first manifests when he gets beaten by some bullies at school. 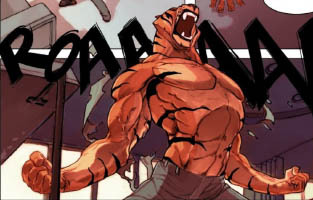 Then he learns that the bodyguard assigned to him, Dan, is the co-bearer of the tiger dizhi, who has been watching and waiting for his powers to awaken. Neither of them want Angel's father to know about their abilities, so Dan starts training Angel in secret, teaching agility, strength and control over his change. Angel wants to destroy his father's crime network, but Dan isn't sure they're up to it. The thing is, Dan isn't the only person keeping tabs on Angel. So is another crime family (who possess the rooster dizhi), and the FBI. They've recruited an ex-Interpol agent named Oswald, who is obsessed with destroying the dizhis. The story likes to make unexpected jumps forward in time to confuse the reader. It can be as little as three hours, or as long as seven years. Flashbacks eventually fill in some of the gaps. The recurring antagonist is Oswald, who has access to a surprising amount of advanced technology. He teams up with Angel's father and becomes a kind of evil Iron Man with his own private dizhi-destroying agenda. Angel goes from Chicago to the Rocky Mountains, back to Chicago, then to East Asia. For a while he moonlights as a vigilante superhero and absorbs several other dizhis. This results in an addiction. As of the 5th French volume, to me it feels like he's finally grown up a bit, except for having coldly abandoned his girlfriend in a fit of emo. Now he's moved to Paris and works at an advertising agency, using his spare time to investigate a series of jewel heists. Oswald, meanwhile, is dealing with a South African crime boss and developing new anti-dizhi tech. The art style has a distinct anime influence, and there are little tributes to other cartoons and comics. Writing-wise, you feel sorry for Angel's situation, but he perpetually feels a bit immature, prone to act on his emotions, and doesn't plan for the long term. As various dizhis are encountered ... I'll be blunt, their powers feel contrived. Like the writer is making it up as he goes along. Dizhi abilities and weaknesses seem to be whatever the plot happens to need at any given moment. There are hints of a larger story, but it's so vague and indistinct that it could literally go anywhere. 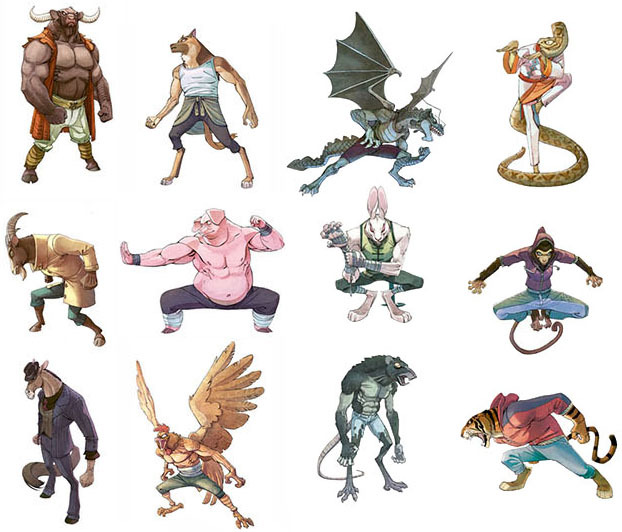 Furry-wise, the dizhi forms mostly show up during fight sequences. There's no slow transformation, although there's an occasional brief mid-form shown. When Angel has several dizhis in him, he can combine their features. (He later finds new bearers for some of them.) 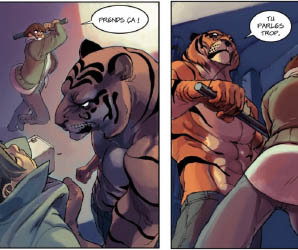 Tiger gets the most attention, since Angel is the main character, so if you're not a fan of tigers, there may not be enough furry content to appeal to you. The comic is mostly human, except during periods of action or stress. No one sits around relaxing and chilling in their animal form. 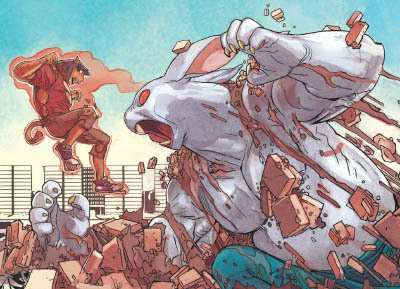 I'm rather ambivalent about this comic, partially because of how the animal powers have been trotted out, but mainly I think it's aimed at a younger audience. It's not bad, just standard superhero fare, albeit with a European flair. Furry-wise, I think all of us would want to see a lot more of the dizhis than the human characters. 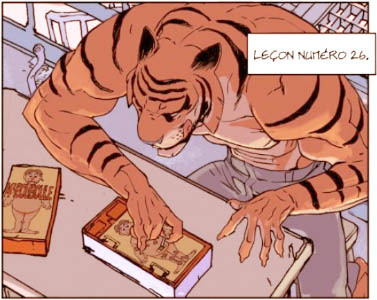 But if you like alternative-style superhero comics, or like tigers, you could certainly give this a try. Magnetic Press' English translation is available for pre-order, scheduled for release on May 25, 2016. It's $24.99, and if that sounds a bit steep, consider that you're getting the first three volumes combined together into one hardcover graphic novel, for a total of 144 pages. (It's actually cheaper than buying the original three French volumes separately.) 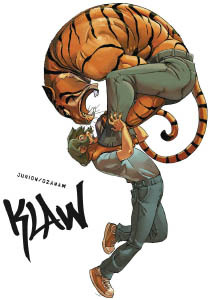 However, because of the human bias in the comic, I'd recommend doing a Google image search to see if it appeals to you; use the words: "Ozanam" and "Klaw". There's also a preview with ten selected pages, a promotional trailer, and a French page with sample drawings you can color. Edit: I've just noticed that Magnetic Press has also reprinted the first two volumes of the French Love graphic novels, which have no dialogue whatsoever, so translation isn't a problem. Why is it called Love? I have no idea. 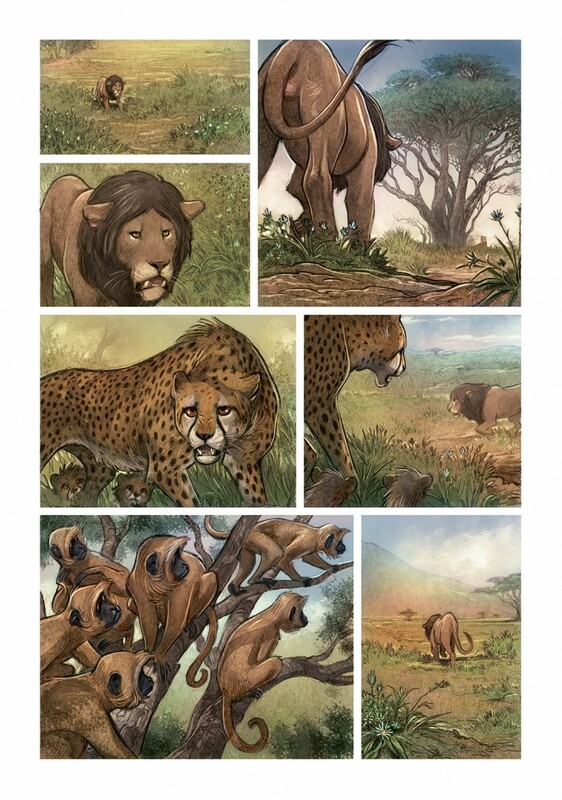 Each volume is an example of purely visual storytelling, following a day in the life of an animal. It's not anthropomorphic, but the quality of the artwork is rich and lush. 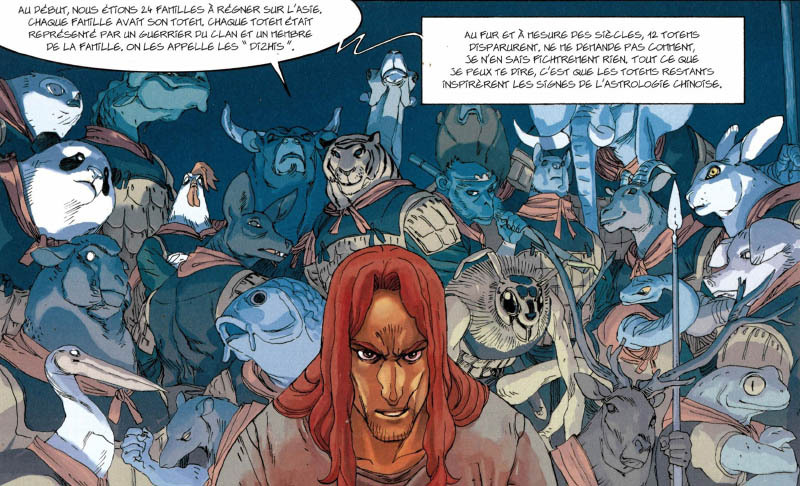 It's written by Frédéric Brrémaud (yes, with two Rs) and the high-quality artwork is by Federico Bertolucci. Beautiful all-ages stuff. 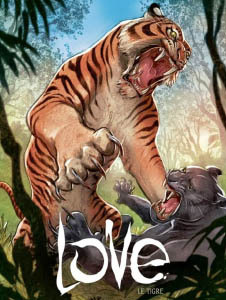 The first volume is about a tiger in the burmese jungle, having a bad day while trying to hunt. The second, which I haven't read, seems to be about a fox on a wintry island trying to escape from a volcanic eruption. 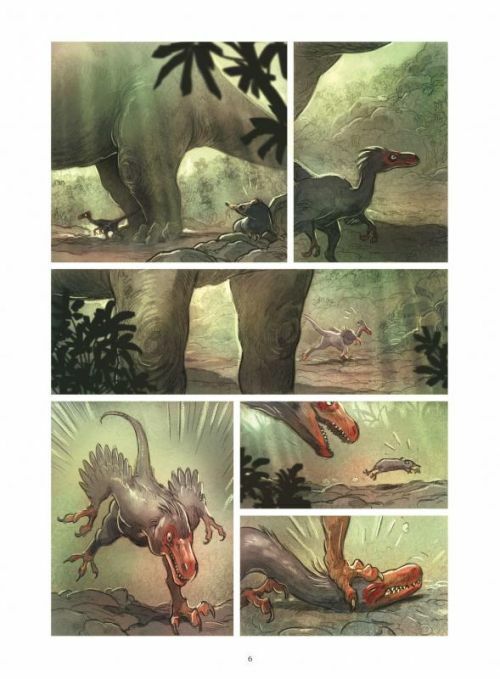 I don't know if Magnetic Press intends to import the next two volumes, which are about a lion and dinosaurs. And finally, here's some more Klaw artwork! Update, thanks to Rod! Magnetic Press is indeed publishing the Love volume about the lion.